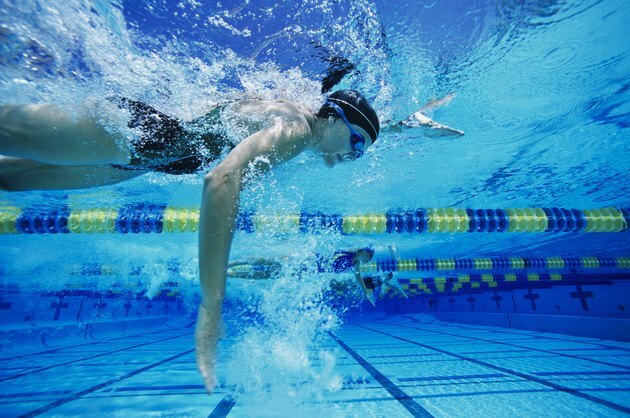 A good aerobic exercise that improves your heart and lung health, lap swimming also helps tone your entire body as it works all your major muscle groups. Swimming is a highly technical sport, though, and swimming properly helps you perform multiple laps without becoming exhausted, no matter which stroke you choose. Basic head-above-the-water breaststroke evolved from the "doggie paddle." The stroke feels natural to you if you started out swimming basic breaststroke when you were a kid, and transitioning from an "above-the-water" to a "below-water" head position is not difficult. You angle your head down into the water, between your streamlined arms, which you hold out in front of you tight against your ears. Try to extend your glide after you perform your "frog" kick until you start losing forward momentum. Breaststroke relies primarily on a strong kick, but using a vigorous pull gives you a good workout, if not a significant boost in speed, according to the U.S. Masters Swimming website. Sidestroke is not an official competition stroke, but it is a good option for lap swimmers who have back or neck problems that make breaststroke painful. You perform a spread-out version of the breaststroke pull and use a scissors kick rather than a frog-style kick during the sidestroke, and you swim on your side facing the pool wall rather than on your stomach. Military forces and lifeguards use the sidestroke in open water or pool rescues because the stroke enables them to get a grab hold of an injured swimmer and bring him back to safety, according to David Thomas, author of "Swimming: Steps to Success." Backstroke is easier than freestyle or front crawl for some swimmers because, unlike the crawl, you keep your face above the surface of the water all the time. In backstroke, you float on your back, and rotate on your side as you take one stroke underwater and then "recover" your opposite arm over your head before taking the next stroke. The backstroke's flutter kick is similar to that of the front crawl, but you keep your legs slightly deeper and avoid bending your knees so that they poke above the surface of the water. Practice swimming straight by keeping your eyes fixed on one object above the pool, such as a light pole, and tracking to either the left, or the right of it. Count your strokes per lap, and keep track of them to avoid hitting your head against the pool wall. Freestyle, front crawl or Australian crawl all refer to the arm-over-arm stroke you swim facing downward in the water. Mastering the breathing technique for freestyle takes time and practice, but once you learn it, freestyle is the most efficient and fastest stroke in the water. You rotate your body and you breathe when your head rotates above the water in conjunction with your torso and legs. Let your legs trail behind and lower the frequency and intensity of your kicking during distance or endurance lap swimming. By propelling yourself primarily by your upper body, you limit using the energy-hungry large muscles in your legs.